As always, opening night will be your first chance to purchase work with the remainder going online at gallery1988.com the following day. Then on Saturday, May 4th (2-4pm) and Sunday May 5th (2-5pm), I'll be down at WonderGround Gallery in the Downtown Disney District. I'm so excited that I'm Artisan of the Month which means WonderGround will be selling a ton of my own prints/magnets for the entire month of May. I chose a lot of images that haven't been available -- until now! They will also have my latest Disney pieces from the Festival of the Arts. So stop by and say hi! I'd love to see you. 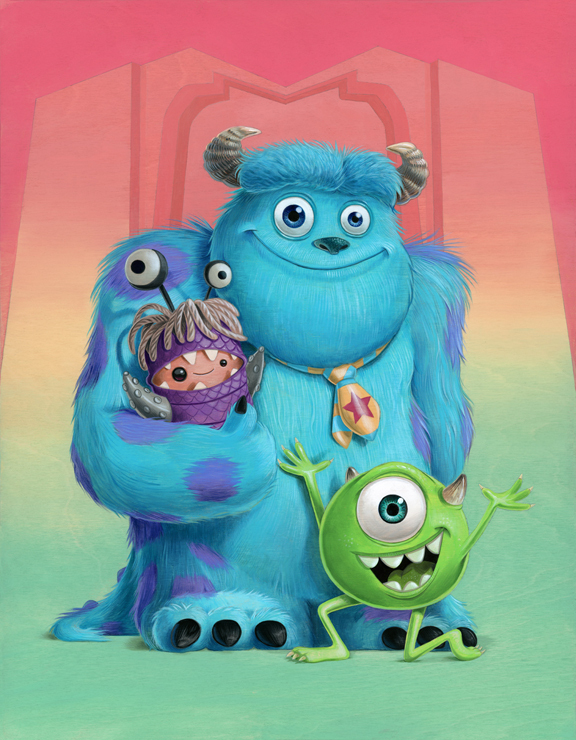 I’m so happy to once again be premiering new artwork for WonderGround Gallery in Disneyland. I’ll be at the gallery in the Downtown Disney District (CA) signing from 2-4pm on Saturday, Oct 20th. See you there! Hi everyone! If you're looking for me or my artwork, I just wanted to let you know that I will be off the grid until July 2nd, 2018. Please enjoy your week and I'll get back in touch with you as soon as I can. Opening this Friday evening is my solo, The Donut Show! I'll be at Gallery 1988 from 7-9pm and this will be your first chance to purchase artwork. There will be 40 original paintings and over a dozen brand new prints to choose from. All remaining artwork will go online Saturday - stay tuned to their social media for when it goes live. I had a blast with this show - hope to see you there! Meet "Maui Mischief", my latest Stitch painting for WonderGround Gallery! This time, he's clowning around with a familiar friend to anyone who has stayed or visited the Polynesian Resort. Now I don't want guests in California to fret because the merchandise for all three will be available at WonderGround Gallery in the Downtown Disney® District too. I hope you can make it out as I love meeting with everyone at these events. I had an urge to paint ice cream and fur and this is what happened. May I present, "Buddies". My latest painting measures 5" x 6" and will be available in my shop Saturday, Aug 19th at 3pm EDT. Thanks! I'd like to introduce...Nectar! He's my latest timed release with the amazing folks at Prints on Wood. Each print will be signed and numbered and the edition size will be determined by the amount sold between now and June 15th. You can even get him with a custom frame as shown above. And below, here he is without the frame. I'm so excited to once again be showing with Gallery 1988! This year's show is especially exciting because I teamed up with my husband, Ed Mironiuk. The theme is Happy Houses and along with my 23 new paintings, Ed built 5 sculptures to go along with the theme! I'll have new prints as well and will be in attendance on opening night at the newly expanded Gallery 1988 West (7308 Melrose Ave, LA) Friday, April 28th. As always, the first chance to purchase artwork will be at the opening, with the remaining items going online the following day. See you soon!